Describing the work of a government agency is not the most exciting of topics. Books on the subject would probably be found in the “Self-help for Insomniacs” section of a good bookstore (there are still some around). But at CIRM we are fortunate. When we talk about what we do, we don’t talk about the mechanics of our work, we talk about our mission: accelerating stem cell therapies to people with unmet medical needs. 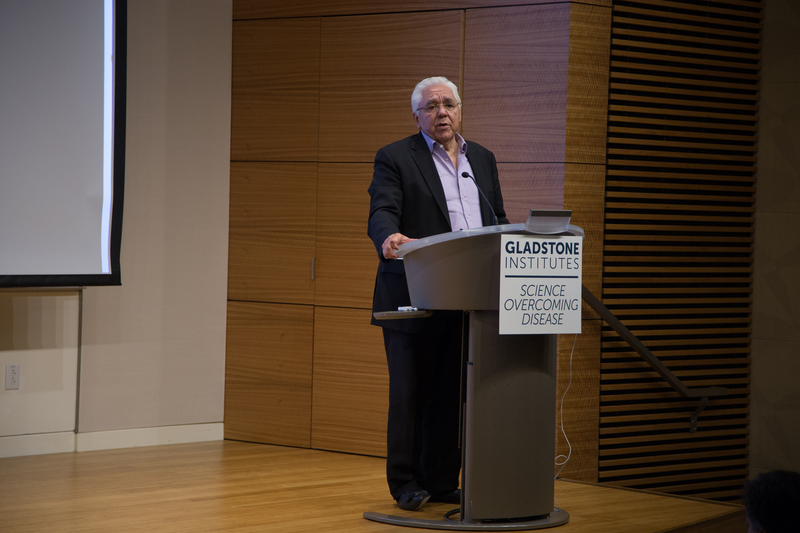 Yesterday at the Gladstone Institutes in San Francisco we did just that, talking about the progress being made in stem cell research to an audience of friends, supporters and patient advocates. We had a lot to talk about, including the 35 clinical trials we have funded so far, and our goals and hopes for the future. We were lucky to have Dr. Deepak Srivastava and Dr. Steve Finkbeiner from Gladstone join us to talk about their work. Some people are good scientists, some are good communicators. Deepak and Steve are great scientists and equally great communicators. 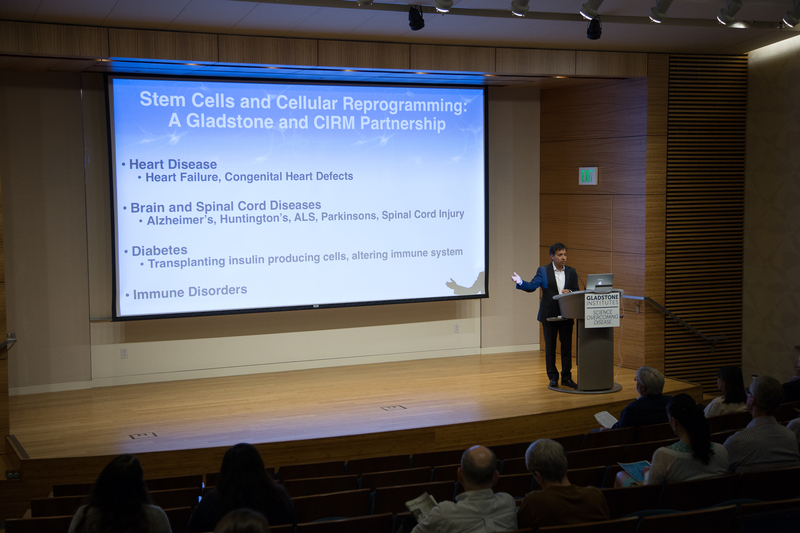 Deepak is the Director of the Roddenberry Stem Cell Center at Gladstone (and yes, it’s named after Gene Roddenberry of Star Trek fame) and an expert on heart disease. He talked about how advances in research have enabled us to turn heart scar tissue cells into new heart muscle cells, creating the potential to use a person’s own cells to help them recover from a heart attack. 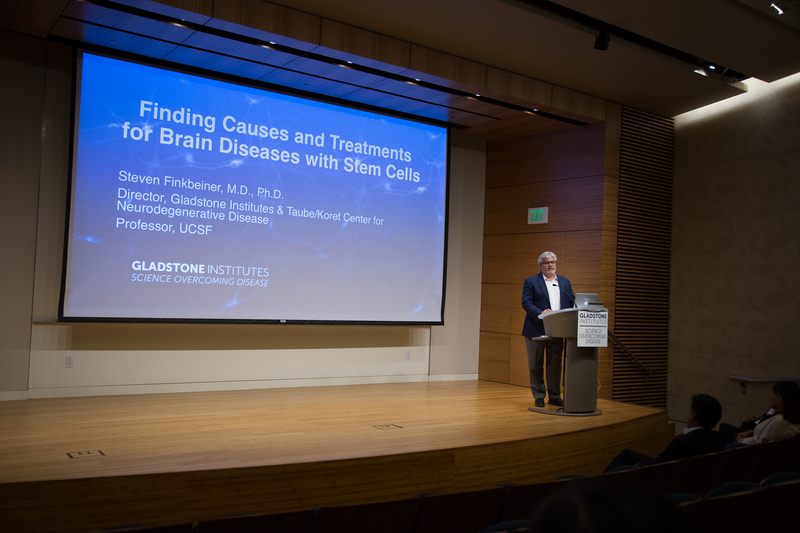 Steve, who is the Director of the Taube/Koret Center for Neurodegenerative Disease Research, specializes in problems in the brain; everything from Alzheimer’s and Parkinson’s to schizophrenia and ALS (also known as Lou Gehrig’s disease. He talked about his uncle, who has end stage Parkinson’s disease, and how he sees first-hand how devastating this neurodegenerative disease is, and how that personal connection helps motivate him to work ever harder. Steve is using ordinary skin cells or tissue samples, taken from people with Parkinson’s and Alzheimer’s and other neurological conditions, and using the iPSC technique developed by Shinya Yamanaka (who is a researcher at Gladstone and also Director of CIRA in Japan) turns them into the kinds of cells found in the brain. These cells then enable him to study how these different diseases affect the brain, and come up with ways that might stop their progress. He uses a robotic microscope – developed at Gladstone – that allows his team to study these cells and test different potential therapies 24 hours a day, seven days a week. This round-the-clock approach will hopefully help speed up his ability to find something that help patients. The CIRM speakers – Dr. Maria Millan, our interim President and CEO – and Sen. Art Torres (ret.) the Vice Chair of our Board and a patient advocate for colorectal cancer – talked about the progress we are making in helping push stem cell research forward. Dr. Millan focused on our clinical trial work and how our goal is to create a pipeline of promising projects from the work being done by researchers like Deepak and Steve, and move those out of the lab and into clinical trials in people as quickly as possible. Sen. Torres focused on the role of the patient advocate at CIRM and how they help shape and influence everything we do, from the Board’s deciding what projects to support and fund, to our creating Clinical Advisory Panels which involve a patient advocate helping guide clinical trial teams. The event is one of a series that we hold around the state every year, reporting back to our friends and supporters on the progress being made. We feel, as a state agency, that we owe it to the people of California to let them know how their money is being spent. We are holding two more of these events in the near future, one at UC Davis in Sacramento on October 10th, and one at Cedars-Sinai Medical Center in Los Angeles on October 30th. Love the word ‘quickly’ in the above research statements! It is always uplifting to read all the hundreds of research strategies and projects everyday but after 10 years of desperate reading, there is still nothing concrete, however the word quickly made an encouraging difference today!